Providing ubiquity is the key to winning the U.S. digital P2P payments war. Boston, May 24, 2017 – The P2P payments market in the U.S. has become increasingly competitive with both financial institutions and alternative players entering the market with innovative digital P2P services. 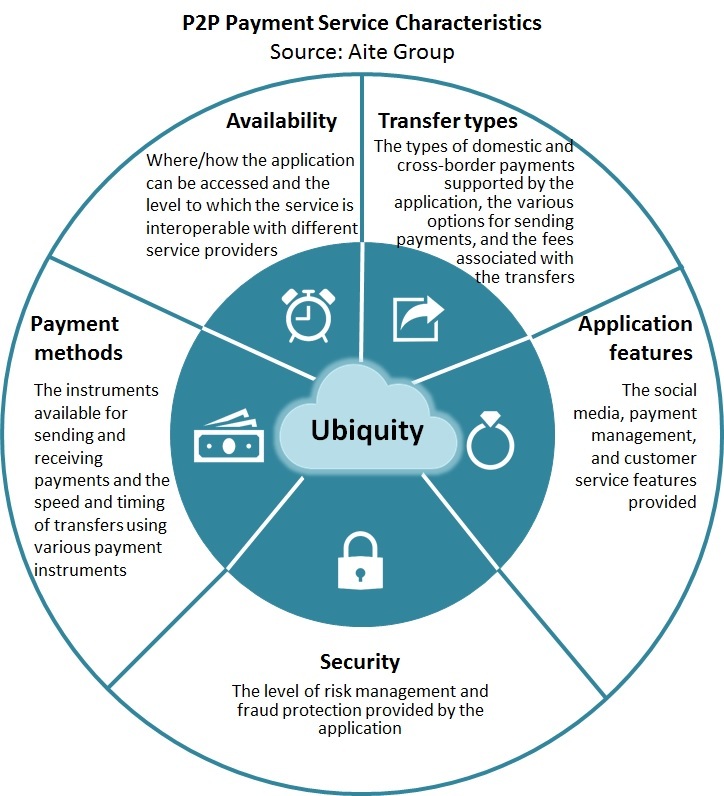 In just the last two years, leading players in the industry are reporting double- and triple-digit increases in the volume of P2P payments, U.S. FIs and financial sector tech companies are building interoperable networks that execute real-time payments, and high-tech companies are making a play for a piece of what Aite Group estimates is at least a US$1.2 trillion market in the U.S. This report provides an in-depth analysis of 11 U.S. digital P2P payments services: Circle, Facebook Messenger, FIS People Pay, Fiserv Popmoney, Google Wallet, PayPal, Payveris PayItNow, Square Cash, Tilt, Venmo, and Zelle. It is based on Aite Group interviews with 23 executives from leading organizations, including both FI and alternative providers of digital P2P payments services, from October to December 2016. It is part two of a two-part series examining the digital P2P landscape in the U.S.—find the first here. This 64-page Impact Report contains 31 figures and 14 tables. Clients of Aite Group’s Retail Banking & Payments service can download this report, the corresponding charts, and the Executive Impact Deck. This report mentions Amazon, Android, Apple, Bank of America, BB&T, CapitalOne, CashEdge, CheckFreePay, ClearXchange, COCC, Coins.ph, Cookies, Crowdtilt, Early Warning Services, Google, Interac e-Transfer, Jonathan Adler, JPMorgan Chase Korbit, Lydia, Mastercard, Moneybeam, N26, Payso, Pingit, PNC, Snapchat, Tencent, TransferWise, Twitter, U.S. Bank, Visa, WeChat, Western Union, WhatsApp, Wells Fargo, Xoom, and ZashPay.